Pope Francis sent a mail to cloistered Carmelite nun Monica Astorga — who for the past 11 years has worked with transsexuals in Argentina, getting them to abandon prostitution and addictions –encouraging her in her work. “I have you and the convent very close to my heart, as well as the persons with whom you work,” wrote the Pontiff, saying that she could tell them. This is part of the message that the Holy Father sent, which was published yesterday in the daily LmNeuquen.com of the city of Neuquen in the south of Argentina. 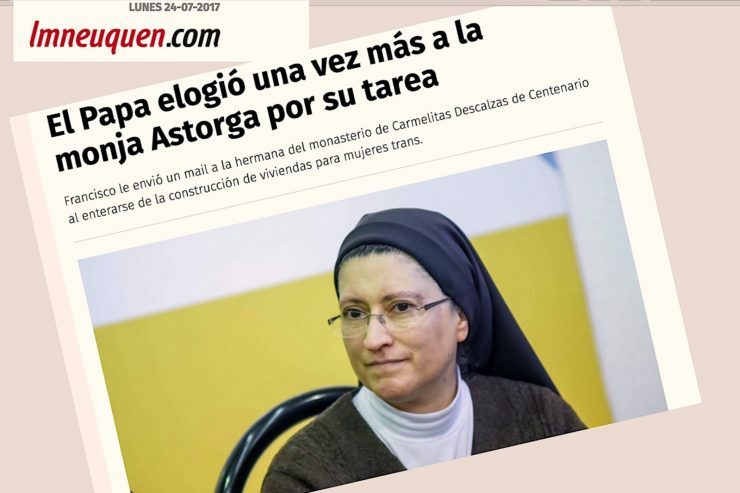 The Pope wrote her “when he learnt of the project to build 15 dwellings for trans women, in the Confluencia district of this city” and “of the opening of a Home for the Elderly, which will be brought to completion by this group,” reported the daily. Sister Monica Astorga, 50, born in Buenos Aires, lives in a convent in Neuquen. At seven, she felt her religious vocation despite her family’s opposition. “I don’t leave the convent; this is my place; from here I can support and push those who need it. My social work rises from here, she clarified in an earlier note to the same daily. Sister Monica added that a girl had come to the convent who wanted to give a tithe. Asked about her work, she said she was a prostitute because, given her transvestite condition, she could not get work. “They asked her if she needed help and it was then that Father Italo (Varvello) and Sister Mariucha (Dambroggio) contacted me and asked me if I could help her,” explained Sister Monica to the daily. When this girl arrived with a group of transvestites, the first thing the nun did was to invite them to the Chapel to pray, “to put all their life in Jesus’ hands and to be able to strengthen their lives.” One of them asked her how they could pray to God when they had been rejected by their parents and relatives. “I asked them to have faith, otherwise, they were dead. Then I asked them what they wanted to do with their lives; what dreams they wanted to realize,” continued the nun. With the help of the diocesan Caritas and other people, they helped them to open a hairdressing salon, a sewing center, etc. Sister Monica said she could not understand how there are men that pay to be with them. “It is indignant because those men pick them up on the street, mistreat them, use them as if they were the rubbish of humanity,” she lamented to the daily.